Horses were the backbone of Edwardian society, and even as the motorcar supplanted the carriage, the measure of a gentleman was always in how he treated his horses. 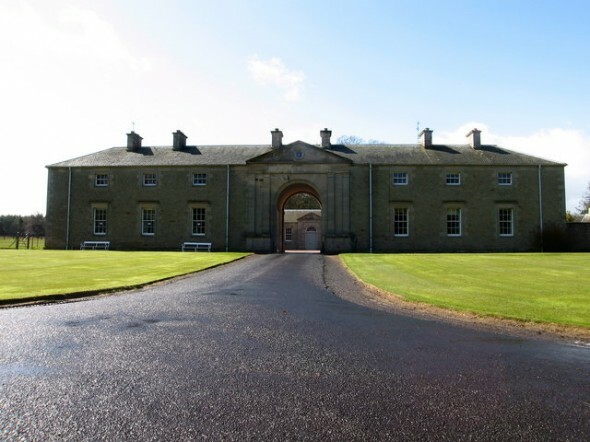 The care Edwardian gentlemen lavished upon their horses was shown in the PBS documentary, Secrets of the Manor House, which featured the luxurious stables of Manderston House–an immense building in and of itself! The American elite copied this practice and also built opulent stables for their horses (Hartwood Acres near Pittsburgh, Philadelphia comes to mind). Naturally, just as the actual manor house required a large staff to keep everything running smoothly, the stables required their own staff of employees to pamper and exercise the horses. Below is a description of the different roles and requirements for a stable, as well as typical wages and livery. The most humble kind of stable manager is a pony boy, whose labour in the stable is one of many duties. In large places, an odd man will be occupied almost entirely with outside house work, and will have little or nothing to say to the stable, which, in the opinion of grooms and coachmen, should be kept sacred from outside intrusion. We meet among cooks, gardeners, and officials of all kinds, the same dislike to unprofessional inspection. In small establishments, the odd man will probably divide his time pretty equally between the house, stable, and garden. The groom-gardener who has at least half of his time for devotion to the stable, may be reasonably expected to look after a horse and trap, or two saddle-horses, the time occupied in the exercise of which might be regarded as equivalent to that spent in driving the dog-cart or gig. Any driving which the groom-gardener would have to do, would naturally be of an unpretentious character, and he would not be expected to wear livery, beyond a top coat and tall hat. A strapper in a hunting stable and a stable helper under a coachman would be on about the same social standing as a groom-gardener. The strapper is not supposed to ride, and the stable-helper not to drive. Either of these men ought to be able to do three horses well, and also to lend a hand at cleaning saddlery, harness and carriages. In a job-master’s yard, in which there is usually the stimulus of tips, more work would be expected, say, that of five, or even six horses; but its execution would be of a rough and ready nature. In tram and omnibus yards, a stable-helper will generally have to do ten or a dozen horses in a “lick and a promise” kind of a way. A single-handed groom or an ordinary groom who is in a subordinate position in a stable, will have a comfortable job in grooming, feeding, watering and exercising two hunters or two polo ponies, which he ought to turn out in first-class style. If he is industrious and has a boy to help him when the ponies are brought on the polo ground for play, he will be able to do three ponies, which he can exercise together by riding one and leading the other two, one on each side. A single-handed or ordinary groom can do all the stable work for three horses which are in work; but he cannot give them a sufficiency of exercise, supposing that he leads only one at a time. The difficulty as to exercise would of course be obviated, if the master or one of his family did all the riding. As a rule, a single-handed groom would not have as much time to devote to the grooming and exercising of his horses, as an ordinary groom; because he would have to do stud groom duties in arranging about fodder, mending of gear, replacement of stable tools, etc. Supposing that a single-handed groom was not expected to ride or drive, and that extreme smartness was not demanded, he ought to be able to look after a two-wheeled trap and harness, as well as three horses. A carriage groom will do about the same work as an ordinary groom, allowing for the time he may be absent from the stable. His duties are to go out with the coachman, sit beside him on the box, perform the work which a footman would otherwise do, clean harness, and strap. A single-handed coachman would be able to do a carriage and pair in first-class style, if the turn-out was not wanted oftener than every second day. We must here bear in mind that the work on the horses, carriage and harness, and the cleaning of the man’s livery, will take about five hours. A groom or coachman would not esteem a single-handed place as much as one in which he had a man under him. Besides, stable servants as a rule like the society of their fellows, and appreciate a comfortable saddle-room, which is a luxury seldom found in a single-handed situation. Married men, and especially those who are no longer young, often like the independence of a single-handed job. A groom-coachman generally has some help. He has to ride exercise as well as drive, and can do a couple of horses. He is simply a groom who has to drive. A second horseman holds a position about equal to that of a groom-coachman, and in a large stable would be under a head groom. In a stable of ten or twelve horses he might act as head groom; and in one of half that size, as working stud groom. In Leicestershire, a second horseman is generally supposed to do two horses and his own hunting things, which I think is more than he can properly attend to, if he has to go out oftener than three times a week with his master or mistress. A working coachman would have to feed his animals, look after their shoeing, trimming, clipping, etc., clean the carriage, do one horse or two if there is not much driving, and exercise. The man under him would muck-out, clean harness, cut chaff, bruise oats, and do the larger part of the grooming. Supposing that there were three horses, which would be a full allowance for the two men, if the carriage went out often; the helper would have to do two horses. A working coachman occupies a somewhat better position than a groom-coachman; because he has not to do the rougher part of a groom’s work, and is supposed to have a carriage groom or helper under him. A head groom in a large hunting stable is like a head-lad in a racing stable; his business being to see that the orders of the stud-groom are carried out. He would probably have to feed the horses, ride exercise, strap one horse, and superintend the cleaning of saddlery. In a stable of, say, fifteen horses or more, I do not think that he ought to be asked to strap. If the master is his own stud groom, the head groom will usually occupy a more independent position than when he is under a stud groom. A man who was engaged simply as a coachman ought not to be expected to strap; for the performance of that duty would practically make him a working coachman. He ought, however, to wash and clean his carriage, do his livery and boots, trim and clip, see to the shoeing, forage, bedding, clothing, harness, stable gear, etc., and superintend all the work done by the men under him, as well as drive. As a rule, when an owner advertises for a coachman with a man under him, he really means a working coachman; because he could not reasonably expect that the stable helper could do all the strapping. A head coachman would be required only in a large establishment, in which there would be also a second and even a third coachman. His duties, like those of a stud groom, would be limited to driving, superintendence and management. A second coachman would have to drive, do the livery and boots of the first coachman, do a carriage, feed and superintend work. The duties of a third coachman would be similar to those of a working coachman. young riding lads, 7 shillings a week and keep; and full-grown lads, 18 shillings with lodging. Men drawing 25 shillings and upwards would probably get a cottage, fire and lighting. Some liberal employers give vegetables and milk. In London, an ordinary groom ought to get 25 shillings a week, supposing that he has to find his own lodging. As a rule, a groom can get board and lodging in a private family of his own position in life, for about 12s. 6d. a week in the country; and in London, for about 16 shillings. Lodging in the country would cost about 2S. or 2s. 6d. a week, and 4 or 5 shillings a week in London. I have found that when seven or eight riding lads club together, they can feed well on 6s. 6d. a week, supposing that they get free fire and room, and that one of them does the cooking. When a riding lad is sent on a journey with or without his horse, he is usually allowed six shillings a day for his extra expenses. Considering the rapid manner in which the incidental expenses of travelling mount up; this concession might be given to ordinary grooms under similar circumstances. In some places, chiefly those in the carriage line, the master gives an allowance for extras and tools, which would include brushes, combs, wash-leathers, rubbers, dusters, sponges, soap, silver-sand, oil for dressing leather, harness composition, scrapers, curry-combs, brooms, hoof-pickers, plate powder, boot-top powder, breeches paste and burnishers. Five shillings a week would be a fair allowance to a coachman for three horses, and a shilling a week for each saddle horse. A shilling may be regarded as the recognised tip to grooms for minor services, such as holding a horse, putting up a horse while the owner is calling at the master’s house, going a message, etc. Half-a-crown may be looked upon as a fair tip to the coachman who drives one away, after one has been on a short visit at a friend’s place. This might be increased according to additional services rendered. A tip to the stud groom for a mount out hunting in the Shires, might reasonably vary from ten shillings to a sovereign, with, say, half-a-crown to the man who had to strap the horse. It might here be objected that the strapper and not the stud groom should receive the larger tip, as he had to do all the work. As a rule, the only stable servants who would wear livery are coachmen (including head coachmen, second coachmen and third coachmen, according to the size of the establishment), carriage grooms, second horsemen, and pad grooms. Their livery would consist of a black silk hat, livery coat (like a frock coat, only single – breasted), waistcoat, breeches and top-boots. Besides these articles of clothing, coachmen and carriage grooms, both of whom are dressed in the same manner, would have a double-breasted top-coat, macintosh, and in some cases a fur cape. All servants in livery should wear a stand-up collar with square ends (not turned down), white cotton (usually pique) tie, and gloves. The livery coat would be of the colour chosen by the master, and the top-coat would be of the same colour, or of drab, which always looks in place with a servant’s top-coat. The buttons of these coats would be gilt or plated, according as the harness and mountings of the carriage were brass or plated. Uniformity as to colour and buttons should be preserved in the livery of the other servants. The livery coat of a coachman and carriage groom would be longer than that of a second horseman or pad groom. Waistcoats are as a rule of coloured stripes, and sometimes of a whole colour, such as scarlet. White buckskin cloth (cotton) is generally used for breeches; although real buckskin (leather), which is a good deal dearer, looks better. The colour of servants’ tops varies greatly; pink, white, straw, cream, salmon, light-brown and nut-brown being the most common shades. White buckskin gloves look smarter than tan leather gloves, which serve their purpose equally well, give no trouble to clean, and cost about half the price. Driving and riding gloves should be at least two sizes larger than ordinary gloves, so that the action of the hands may be in no way cramped. If smartness is not aimed at and a special colour for the livery is not assumed, the coachman may with propriety wear plain dark-coloured trousers along with a black or dark blue livery coat. Trousers in this case will look much better than breeches and gaiters, which is a combination that has been handed down from early Christian times. I may point out that a “gaiter” is a combination of a legging and a spat. In winter, even fashionable coachmen often wear trousers and boots of nondescript pattern, so as to save their breeches and top-boots; for as they have not to get off the box until they are within their own yard, the lower part of their body will remain hidden by the apron from public view. As a carriage groom will have to be ready to dismount at any time when out driving, he cannot safely follow the example of the coachman in this respect. The servants in stables of good class are usually allowed a suit of stable clothes every six months, after which time they are generally considered to belong to the servant. It is, however, more satisfactory to both parties for an arrangement as to the possession of used clothes, both stable and livery, to be definitely fixed before engagement. A suit of stable clothes consists of a coat, waistcoat and breeches of strong tweed and leggings of box-cloth; or coat, waistcoat and trousers, according to the requirements of the particular servant. Some masters allow a pair of lace-up boots (preferably without hooks) along with the half-yearly suit of stable clothes. A good portion of the expense of this concession comes back to the giver by the fact that with a liberal supply of ordinary boot-leather, the servant will not be inclined, as he might otherwise be, to wear his top-boots under his trousers. The length of time which livery is supposed to last will depend on the degree of smartness demanded by the master. If the family goes up to town every year, a new suit of livery all round will probably be required at the beginning of each season. A second horseman will certainly need two pairs of white breeches to start with. The same allowance might be made to carnage grooms and pad grooms, and might be extended even to coachmen. Some masters supply collars and white ties and pay for their washing. The stables, as seen in your photo and in many other large rural properties, were monumental pieces of architecture in their own right. And expensive to build. This suggests that the horses, and perhaps their attendants were more important than other staff in the household. Were there ever any rooms for grooms etc in the stables? This is such a great post! So informative. Thank you.